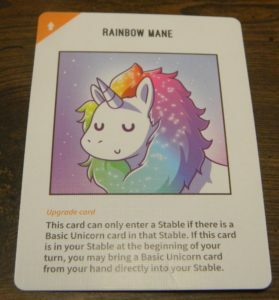 Originally released as a Kickstarter game back in 2017, today I am looking at the card game Unstable Unicorns. I had some mixed feelings about the game when I first saw it. With the game being based entirely around unicorns, most people would expect that it would be gauged towards teenage girls. The theme didn’t really appeal to me as I don’t have feelings either way about unicorns. The main reason that I was interested in checking out Unstable Unicorns is that I generally like these type of card games. Unstable Unicorns is a chaotically fun card game that unfortunately never distinguishes itself from the pack. Each player takes one of the reference cards and places it where they can see it. 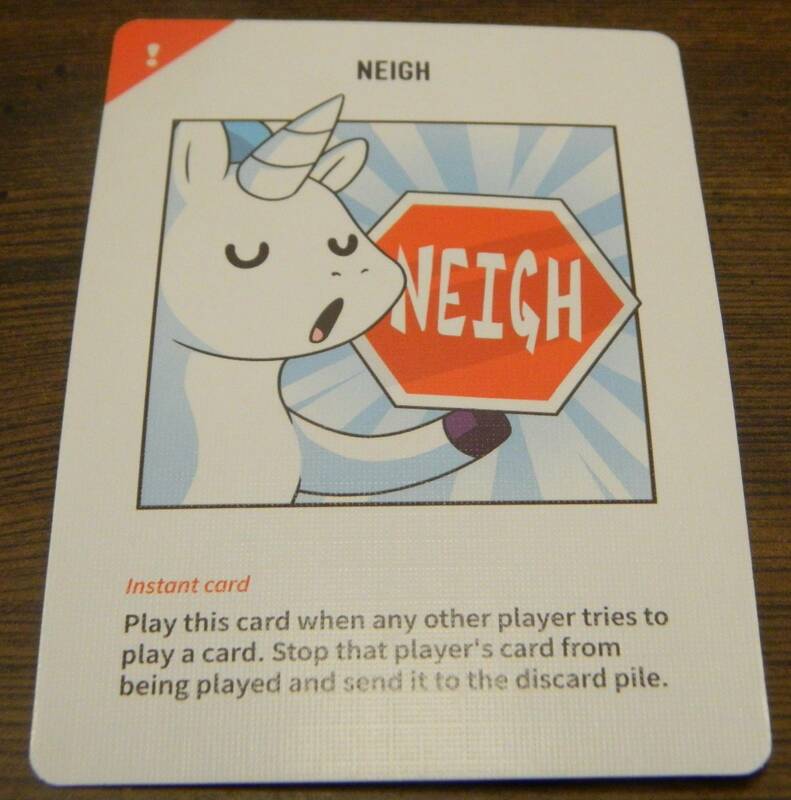 All of the players choose their favorite baby unicorn and place it in their stable (the cards played out in front of a player). The rest of the baby unicorns are placed in the nursery (a pile in the center of the table). Shuffle all of the cards with a black back. Deal five cards to each player. The player with the most colorful clothing will be the first player. Before a player begins the rest of their turn, they will look at all of the cards in their stable. If the text on any of the cards in the current player’s stable start with “If this card is in your stable at the beginning of your turn”, the player might have to take special actions this turn. Depending on how the text is worded, the player could either be forced to take the action or they may have the option to not use it. If a player chooses to not use an optional action, they cannot choose to use it later in their turn. When the effects of an action are applied, they may trigger effects on other cards. All of the cards that are initially triggered will be handled first before the cards they triggered are handled. At the beginning of their turn this player had two cards in their stable. The player can choose to use their unicorn lasso in order to steal a unicorn card from another player’s stable. At the end of their turn they would then return the unicorn to its original owner. The current player will then draw one card from the deck. 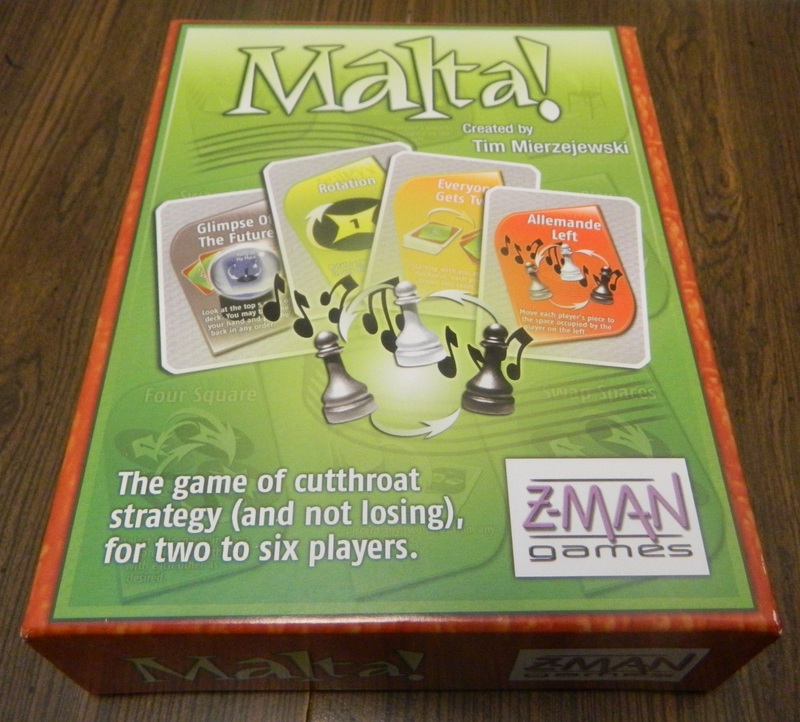 In the action phase players can choose one of two actions. First they can choose to play one of the cards from their hand. Some cards are played for their effect and are then discarded. Other cards are added to a player’s stable. See the card section below for more information. Players count up how many cards they have in their hand. If they have more than the hand limit of seven cards in their hand (unless modified by another card), they will have to discard cards until they are below the hand limit. Instant Cards: Instant cards can be played anytime, including during another player’s turn, when another player plays a card. If an instant card is played against a card you played, you may then play an instant card to counteract the instant card that was played. Players can continue using instant cards to counter previously played instant cards. Upgrade Cards: Upgrade cards generally give players a benefit. They are played in front of any player (doesn’t have to be the player who played it) and they are added to that player’s stable. Downgrade Cards: Downgrade cards generally hurt the player that they are played in front of. Downgrade cards can be played in front of anyone (doesn’t have to be the player who played it) and are added to that player’s stable. Magic Cards: Magic cards are played for their effect. The card is read and the appropriate action is taken. Once the effect has been applied, the card is discarded. Unicorn Cards: Unicorn cards come in three varieties. Baby and basic unicorns have no special effects but they count towards your total unicorn count. Magical unicorns have special effects that either apply when they are played, can be activated at the beginning of a turn, or they can be continuous. 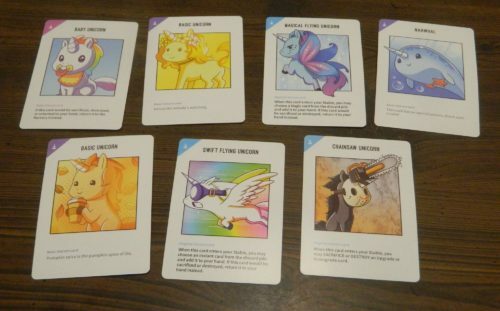 This player has acquired seven unicorn cards so they have won the game. If the draw pile runs out of cards and none of the players have reached the required number of unicorns, players count up how many unicorns they have. The player with the most unicorns in their stable wins the game. If there is a tie, the tied players count up the number of letters in the names of their unicorns. The player whose unicorns have the most letters in their names, wins. If there is still a tie, all of the players lose. 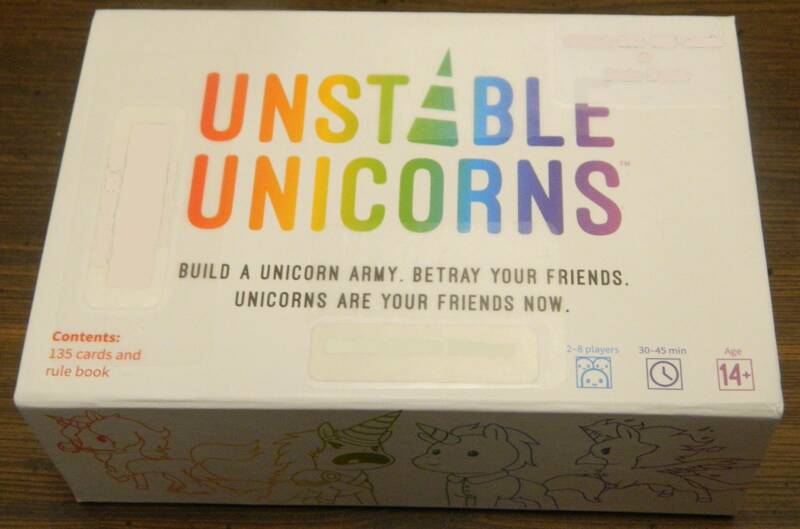 Unstable Unicorns is a game that you can’t really judge by its’ cover. 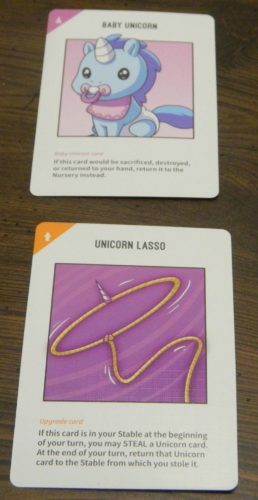 Most people’s first thought when they see Unstable Unicorns is probably going to be that the game was made for younger girls due to the unicorn theme. While the game does not shy away from using the unicorn theme, it will appeal to a much larger audience than the theme would indicate. Basically Unstable Unicorns is a pretty typical card game. You draw and play cards with the ultimate goal of getting six or seven unicorns in front of you. 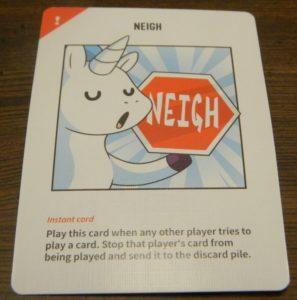 To accomplish this task you need to use special abilities on the cards in order to add unicorns to your own stable while also sabotaging the other players. Like a lot of these type of card games, Unstable Unicorns is really easy to pick up and play. Your basic turn consists of drawing and playing a card. Pretty much the only difficulty in the game comes from figuring out how to apply the cards’ special abilities. Unstable Unicorns is one of those type of card games where most of the game is based around using the special abilities on your cards. You will be spending a decent amount of time reading the text on the cards and figuring out how best to use the cards. The game is simple enough that people that don’t generally play card games, shouldn’t have any problems playing the game. The requirement to read and understand all of the text means that younger children may not be able to play the game. I think the game goes a little too far with the 14+ age recommendation though. Outside of a couple cards possibly being a little too adult in subtle ways, I don’t see any reason why children around ages 8-10 couldn’t play the game. As I already mentioned, the key to Unstable Unicorns is taking advantage of the cards in your hand. There are cards in the game that have no special abilities and thus can be taken at face value. For most of the game though you have to analyze the text on the cards in order to best use the cards. In particular it is good to try and form a strategy that tries to capitalize on the cards in your hand to create situations where cards play off one another. As I will get to later, setting up a good combo is one of the best ways to win the game. This is the aspect of Unstable Unicorns and other similar card games that I have always enjoyed. It is satisfying figuring out a way of utilizing your cards to outsmart your opponents. You will have to come up with a good strategy because Unstable Unicorns can be quite chaotic. There are basically two strategies in Unstable Unicorns. You can help yourself by playing unicorns to your own stable and other cards that give you a benefit. At the same time you can play cards that hurt your opponents. Your fate in the game can change quickly. If you are close to winning the game, the other players are likely going to gang up on you and send you back to the middle of the pack. As you will become a target as soon as you get close to winning the game, you need to try and hide your strategy for as long as possible. You probably want to try and come up with a strategy that allows you to acquire several unicorns on your turn. Unless you can keep your strategy hidden though, your fate kind of relies on the other players. Thus at times it feels like it is kind of random who ultimately wins the game. This chaos leads to the cards themselves. Simply put, the cards in Unstable Unicorns are not balanced. Some cards have no abilities at all while other cards have abilities that are game changing. In order to do well in the game, you have to make good use of your cards. That said, if you aren’t dealt any of the good cards you aren’t going to do well in the game. Therefore there is a quite a bit of luck in the game. The player who is dealt the best cards will have a distinct advantage in the game. You still have to use the cards well in order to win though. Generally I don’t mind this randomness as it is kind of fun knowing that anything can happen at any time. Unstable Unicorns is not meant to be taken as a serious game. The fun in the game comes from the fact that things are always changing. It is not always fun getting bad cards while others get good cards, but to enjoy the game you need to just have fun and not worry about winning the game. The good news is that the game is usually pretty short, so if luck is not on your side the game is not going to go on forever. Your luck can change quite quickly as well so if luck is not on your side it can change at any moment. With how random the game can be at times, I would guess most games should take around 15-45 minutes. I would say that the biggest problem with Unstable Unicorns is that is it not particularly original. None of the mechanics in Unstable Unicorns are particularly original as they have been used in quite a few other card games. 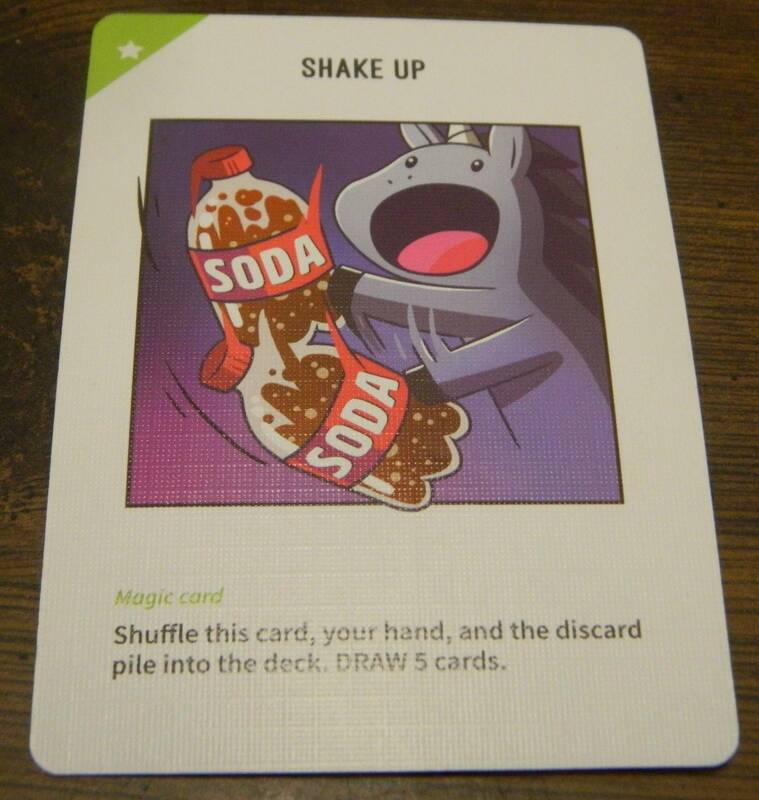 I have played a lot of different card games and there have been several games that were very similar to Unstable Unicorns. The premise of cards having special abilities that can be used to help yourself or hurt others have been used in many other games. Even the idea of getting a certain number of unicorns/items in front of you is similar to quite a few other card games. If you have never played one of these type of card games before, this isn’t that big of deal. If you have already played one of these type of games before, Unstable Unicorns is not going to be particularly original to you. The only area where the game is going to significantly differ is the theme. While I can’t say that I really care about unicorns, I have to say that the game does a good job utilizing the theme. Unicorns are all over the game including some animals that are pretending to be unicorns. The theme has no impact on the gameplay but I still think it is well done. What makes the theme really shine is the fact that the artwork is really good. The artwork for the most part is really cute where it is hard not to smile even if you hate unicorns. 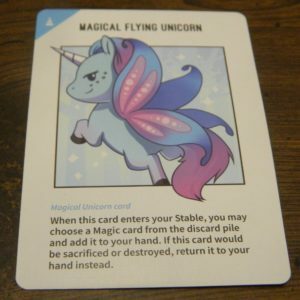 I don’t think the theme is strong enough to be the sole reason to purchase Unstable Unicorns, but I think it will really appeal to people that like unicorns. On the topic of the card’s artwork, I thought the game’s components were quite good. The card quality is pretty typical for this type of game. The cards are thick enough that if you take care of them they should last. While I really liked the cards’ artwork, I think the cards’ text could have been larger. For a game that requires players to read a lot of text, the text is pretty small. People that have bad eyesight may have troubles reading the cards. Finally I commend the game for including quite a few cards. These type of games generally require quite a few cards. I was happy to see that the game included 135 cards. With that many cards it is unlikely that you will ever play the same game with all of the different potential combinations. Should You Buy Unstable Unicorns? While the unicorn theme is probably going to immediately turn off some players, you shouldn’t judge Unstable Unicorns based on the cover. Unstable Unicorns is a good card game. The basic premise of the game is simple. You draw and play cards until someone has six/seven unicorns in front of them. The true game comes from figuring out how to best use your cards with special abilities to create a combo that eventually leads to your victory. Unstable Unicorns can become truly chaotic at times as players will want to gang up on the player in the lead. This is increased by the fact that all of the cards are not created equally so there is card draw luck. The biggest issue with the game though is that it is not particularly original. There are quite a few other cards games that are very similar. The good use of the theme along with the cute artwork helps the game standout against a lot of the other similar card games. 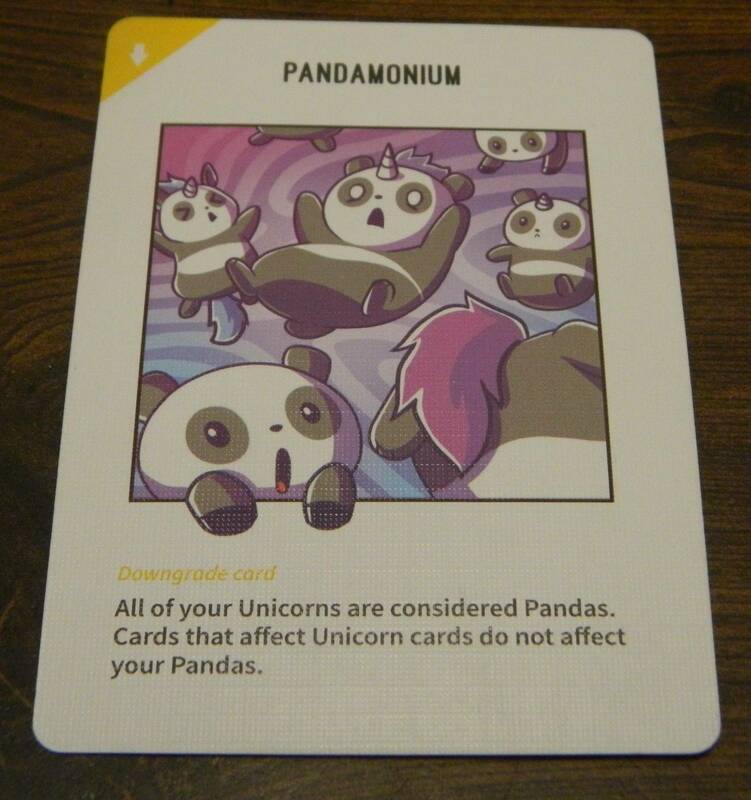 At the end of the day Unstable Unicorns is a good card game that is not particularly original. People who don’t typically like card games that require you to read and understand a bunch of special text won’t like Unstable Unicorns. If you already own one of these type of games and don’t really care for the unicorn theme, there is nothing special about the game where you need to pick it up. 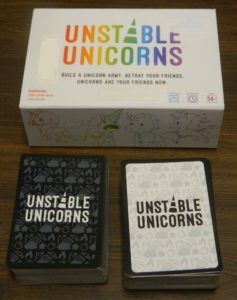 If you really like unicorns or are in the market for one of these type of card games, you should enjoy Unstable Unicorns. For a good price I would recommend picking up Unstable Unicorns. A fun slightly chaotic card game where how you use your cards makes a difference. The artwork is cute and the game does a good job using the theme. Is similar to a lot of other card games. Relies on a lot of card draw luck.